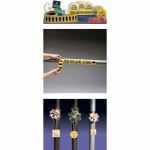 Description: Pipe Markers and Valve Tags Model: Pipe Markers and Valve Tags Mark and identify pipes, valves and equipment Seton offers a wide variety of Pipe Markers, Valve Tags and many other Accessories for all of your marking needs. Custom Valve Tags are available and most ship same day. 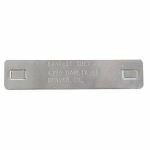 Description: Print your own tag on 304 or 316 stainless steel and apply with Tie-Lok ® ties. Tag imprinter is available with a choice of character sizes.